The Nikon Coolpix AW130 is an evolutionary upgrade to last year's AW120. Its main claim to fame is its upgraded weatherproofing, which now allows the camera to be taken to a depth of 100 feet or 30 metres. Other improvements include the addition of NFC (Near Field Communication) functionality, a dedicated Wi-Fi button and a small but useful hand-grip that makes it easier to hold the camera firmly in your hand. These novelties, in addition to the numerous features carried over from the AW120 – such as geotagging, a built-in world map, compass, depth gauge, altimeter, Wi-Fi connectivity, 24-120mm equivalent lens and Full HD video capture – make the Coolpix AW130 a very well-rounded offering. Just like its predecessors, the Nikon Coolpix AW130 is a pleasantly responsive little shooter. Start-up takes just over a second, and focusing is also commendably fast, at least in good light. There is a comprehensive suite of continuous shooting modes, too. Image quality is unchanged from the AW120. When viewed at 1:1 magnification, the images captured by the Nikon AW130 tend to look quite disappointing, with smeared details and other signs of overzealous noise reduction. That being said, the photos still contain enough information to produce nice-looking prints up to at least 18×24cm size, and they also look pretty good at most screen resolutions. The internally stacked zoom lens covers a very useful focal range of 24-120mm (in 35mm terms) but tends to produce noticeably soft corners. Chromatic aberrations are minimised through clever software algorithms, and the limited dynamic range of the 1/2.33”-type sensor can be expanded through HDR shooting or optimised through post capture D-lighting. We weren't thrilled with the camera's night shooting capabilities, but the lens-based Vibration Reduction did a very good job. 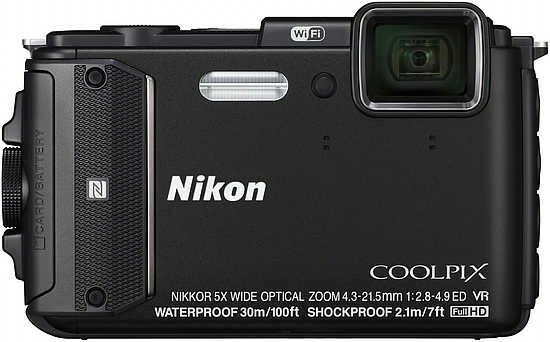 Overall, the Nikon Coolpix AW130 is a remarkably well-specified offering in the concintuously expanding tough camera segment. As long as you don't have very high expectations regarding image quality, it can serve you very well in a wide variety of both regular and extreme shooting conditions.